Mega is the cloud storage service formerly known as Megaupload that was founded by Kim Dotcom. Mega has launched official app for Android devices, originally the app was designed by third party developers. The company acquired that app and redesigned with some changes and re-launched in the Google Play Store. Also it announced the app for iOS and Windows devices will be available soon. Mega Cloud Storage offers 50 GB of free online storage for every new signup. 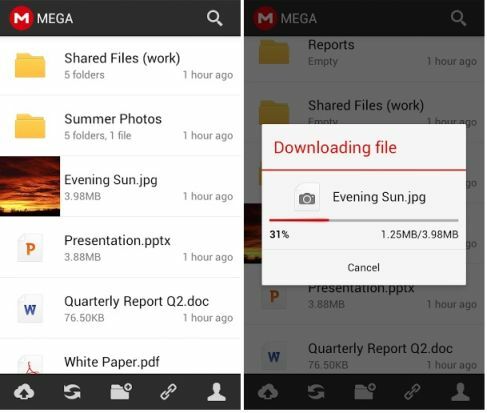 With this app you can access your Mega account, browse your files, download and upload files, search files from your Android device. Everything you upload to Mega is completely encrypted, so your files will be much secure. The app has some updates including automatic uploading of photos and videos when you capture. •	Export and send file and folder links to anyone. •	Thumbnail view for images. •	Create, delete, rename and move files and folders. Download Mega Cloud app for Android from Google Play Store.